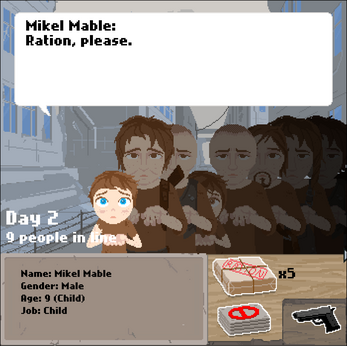 Your job is to pass out rations in a war-torn country, with hardly enough to go around. You must tell the survivors "you only get one". Who do you decide to feed? Do you want the soldiers to stay alive to protect the commonfolk? Do you save the women and children, the aged, the unemployed? Will you take bribes, or succumb to violence? Their fates are in your hands. 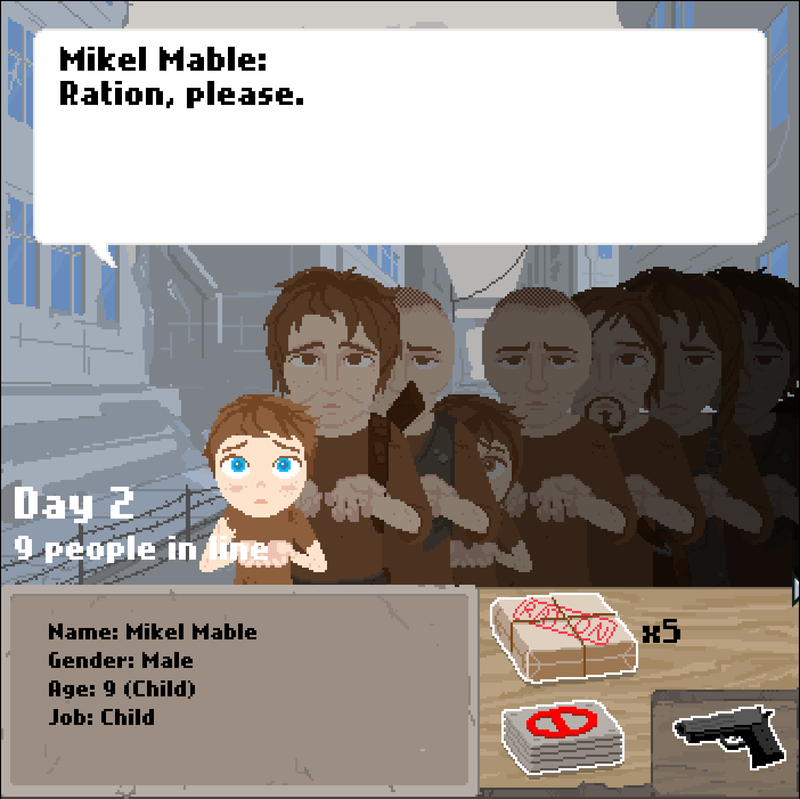 Click the ration to hand it to the current survivor in line, click the X card to deny a ration, or click the gun to eliminate. I am using Microsoft Edge, I have Adobe Flash enabled and other flash games work but this doesn't. Please fix this! Cool game, though why do so many people die on the first day? 1) Click the i on the left of the url address. cool game. I survived with 2 people lol! It's not working for me, even though I have flash. Is it on any other website? Cant seem to run even with flash. Im fully up to date. I'm glad to see that this game is still around, after all it was the first one of Vu Ha, Rose Peng and Johan Soriao that I played and recommended on our blog! :) I'm a sucker for "Papers, Please! "-like games anyway, so that one was a blast for me. In its shortness it managed to create some dramatical decisions that had to be made. It's great that it got the 35th place in the whole Ludum Dare 28, a well deserved score! :) Congratulations to that. For potentially interested players I added our gameplay video about it. <3 Keep it up! Yeah ! I survived with 6 people ! I'd love it if you could make this available for Windows. I enjoyed the concept, good music and art. But I wish I could do to more with my extra rations! He he sadly me too I was the only one to survive. What software was this created with? Neat game with a very compelling theme. It'd be interesting to learn how the mechanics underneath are really wired up. I liked the art and the music fits the game. And of course I liked the idea. Great job guys. But this two things didn't bother the experience that this game brings.